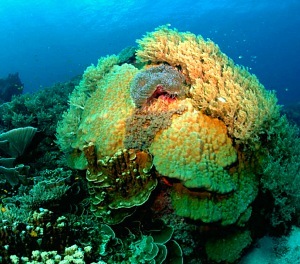 The Anambas Archipelago is part of Riau Islands Province. Perhaps it's the way South East Asia travelers typically are rather unfamiliar with this name, Riau, that in the past, Anambas hasn't featured widely on their holiday radar as a paradise island getaway. However, this is now changing. The reason the Anambas territory is becoming more and more popular as a holiday destination is twofold. First, it's become clear to both the traveling community at large and travel agents, that Anambas is as attractive, if not more attractive, than its Indian Ocean counterpart, Maldives. This is no exaggeration; just one glance at some of the images taken of the crystal-clear azure-colored waters around Pulau Bawah, for instance, and you know that the Anambas Islands are sheer paradise. The other reason for Anambas gaining popularity is that, contrary to Maldives, the Anambas islands offers a much more varied idyllic holiday island experience. 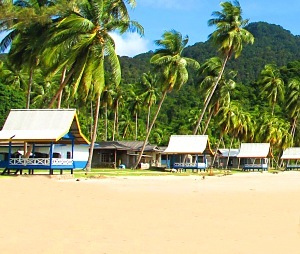 For example, a number of Anambas islands lend themselves ideally for eco-adventures. Jungle-trekking, hill-climbing, mangrove-cruising, bird-watching, and various other nature activities relating to the awesome Anambas flora and fauna, are all available in and around the Anambas islands. Note: If you've always wanted to see Rafflesia, the world's biggest flower, now is the time to give it a go, because the largest of all Rafflesia species has recently been discovered in Anambas! In Anambas the jungles especially really are alive. In fact, swaths of jungle here have remained untouched by human interaction until today. So if you're even remotely interested in Biology, Zoology or Botany, then you can be sure that you'll have an absolute blast in Anambas. 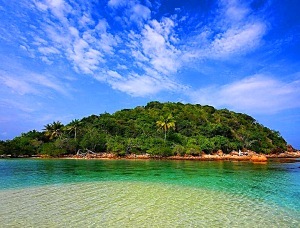 Speaking of nature, let's not forget turtle-watching at the now-famous turtle islands, Pulau Durai and Pulau Mangkai. These islands have been allocated turtle conservation status, because as far as the locals can remember, their beaches have been the spawning grounds for green turtles and hawksbill sea turtles. If you're interested to see turtles come ashore for egg-laying, or perhaps you want to witness the hatching of the eggs and the subsequent mass exodus to the sea of the baby turtles, then make your way to either Pulau Durai or Pulau Mangkai around the months of May to August. In all likelihood, you won't be disappointed. When it comes to scuba-diving, clearly, Anambas is scuba-diving heaven. Sea water visibility can exceed 30 meters and more often than not, coral gardens extend as far as the eye can see around most islands. 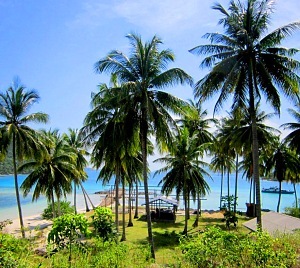 Examples include Pulau Ayam, Pulau Penjalin and of course Pulau Bawah. If it's wreck diving you prefer, then you can dive to your heart's content at Igara or Seven Skies, both renown scuba locations, for those keen to see large fauna, as well those interested in macro. Now, if you're an sport-fishing aficionado, then you should know that the waters around the Anambas Archipelago are especially fertile. You'll find that tuna are on the hunt all around your vessel pretty much all the time, resulting in ever-present patches of "nervous water", where these predatory fish are terrorizing schools of baitfish in their feeding frenzy. 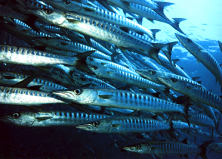 Frequently, the commotion also involves sea birds from above and, more importantly, pelagics from below, such as barracuda and mackerel and even billfish. Other commonly caught fish here include GT, red snapper, trevally and grouper. By the way, if you're into squid, then rest assured, these are also plentiful. Resorts on most of the islands, whilst not yet plentiful, offer adequate choice. Best of all, pick your resort right and you'll hear the mesmerizing wash of the ocean while you sleep at night. When it comes to food, you'll be quite pleasantly surprised at the low cost of meals in Anambas – especially the cost of seafood dishes, which are available everywhere (for obvious reasons). Do have a go at Tarempa Mie, which is a local delicacy. But take note, some dishes can be on the spicy side, so be sure to taste a little bit first before finding yourself with a big serving onto your plate. As far as travelling around the Anambas islands, it should be pointed out that public transport from A to B here doesn't always favor those that are in a hurry. Since the usual mode of transport between islands is by a ferry or boat, you best just sit back and enjoy the ride. This isn't even all that odd a piece of advise, because in almost all cases, the sea you'll be traversing will be an absolute sight for sore eyes. And this also applies to the many breathtaking panoramas that you'll be encountering along the way. Getting to the Anambas Archipelago is relatively easy. For details on how to travel to Anambas, click Anambas Ferry. But no matter which Anambas island you travel to, or if you're traveling solo or with friends, family or your partner, you can be sure that the Anambas islands will have something to please you and each of your travel companions.